T his book presents a t.hooretical framewerk and control methodology for a class of complcx dyna.mical systenis characterized by high state space dimension, multiple inpu t.s anrl out puts. significant nonlinearity, parametric uncertainty and unmodellod dyuarni cs. The book start.s wit.h an inl.rod uct.orv Chapter 1 where the peculiari- ties of control problcrns Ior complex systems are discussed and motivating examples from different fiolds of seience and technology are given. 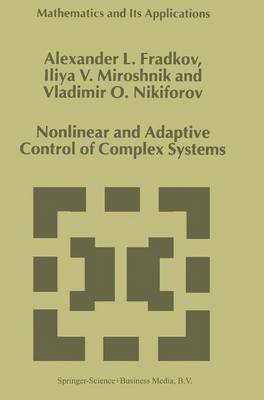 Chapter 2 prcscnts SO Il I(' rcsults of nonlinear control theory which assist in reading subsequent chaptors. The main notions and concepts of stability theory are int roduced. and problems of nonlinear transformation of sys- tem coordinates an' discussod. On this basis, we consider different design techniques and approaches t 0 linearization. stabilization and passification of nonlinear dynamical SySt('IIIS. Chapter 3 gives an cx posit.ion of the Speed-Gradient method and its ap- plications to nonlinear aud adaptive control. Convergence and robustness properties are exam iued. I~ roblcms of rcgulat ion, tracking, partial stabiliza- tion and control of 11amiItonia.n systerns are considered .